Made by Soldiers' Sock Fund in Australia, Oceania, 1914-1918. This booklet was printed by the Soldiers’ Sock Fund to provide instruction for knitting socks for soldiers during World War One. Proceeds from the sales of the booklet also went to the fund. Stapled 12 page booklet entitled 'The Grey Sock'. 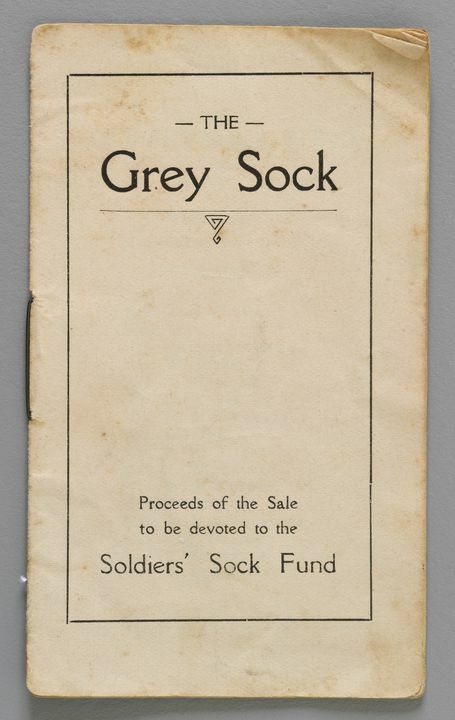 The cover reads: 'THE / Grey Sock / Proceeds of the Sale / to be devoted to the / Soldiers' Sock Fund'. Contains instructions for knitting grey wool socks. The instructions have been annotated in ink. The booklet was produced by the Soldiers' Sock Fund and all proceeds from its sale went to the fund. It is likely that the booklet was published in 1914 or 1915 as most funds were integrated into the Australian Comfort Funds or the Red Cross from 1916. The hand-written annotations suggest that this book was actually used for knitting socks. The booklet was donated to the Macleay Museum and has been transferred to the Museum.